3.4 What more can we do? Continuing food poisoning outbreaks around the globe have put fresh produce safety at the forefront of food research. 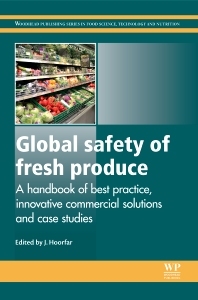 Global Safety of Fresh Produce provides a detailed and comprehensive overview of best practice for produce safety throughout the food chain, and unique coverage of commercial technologies for fresh produce safety. Part one covers the production and regulation of fresh produce on the agricultural level, including issues of niche farm fresh products, FDA regulation, and zoonotic transfer of pathogens from animals to farm products. Part two moves on to look at safety and environmental issues surrounding fresh produce processing, such as postharvest washing, alternative sanitizers, and using produce waste as animal feed. Part three focuses on current and emerging commercial solutions for fresh produce safety, like ionizing radiation and edible coatings, and part four covers methods of laboratory testing and related legislation. The final section of the book covers a series of case studies of fresh produce safety breaches, including European E. coli outbreaks in sprouts and leafy greens, and the illegal use of fluorescent whitening agents (FWAs) in China. This book is an essential text for R&D managers in the fresh produce industry, quality control professionals working with fresh produce throughout the food chain, postgraduate students, and academic researchers with an interest in fresh produce safety. Jeffrey Hoorfar is a Professor and Research Manager at the Technical University of Denmark.